Text analytics has become an increasingly sought after tool in the financial sector. With more than 80 percent of textual data in an unstructured form, it is now turned into valuable data-driven analytics. Text analytics is about deriving high-quality structured data from unstructured text, which has become increasingly valuable to the financial sector. Widely used data sources for text analytics include social media, along with internal and external email, instant messages, news articles, online forums. Other used sources can include documents in a variety of formats such as PDF files or xml, and online forms such as applications containing text or forms containing structured data stored as text. One of the most widely output of text analytics is sentiment analysis. Sentiment analysis is the process of assigning a sentiment score to entities detected in text. Financial professionals use the predictive power of these scores on a variety of financial applications. What is RavenPack Text Analytics? RavenPack is well known in the quant space for its off the shelf news and social media analytics, that allow clients to enhance returns, reduce risk or increase efficiency by incorporating the effects of public information (more than 19,000 sources) in their models or workflows. The RavenPack platform allows their users to query and visualize data on over a quarter of a million entities, including companies, commodities, currencies and products, with analytics on the roles that entities play in events, and the relevance, novelty and sentiment of the mentions. We are the pioneers in text analytics for finance, developing our products since 2003 and proving the value that lies in our analytics with 50+ white papers from our own Data Science team, top investment banks, Ivy League universities and specialist research firms. 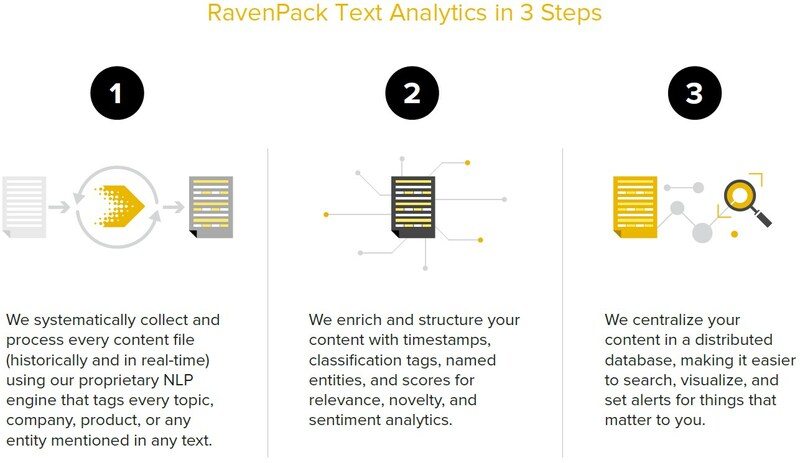 We have recently released a new product line called RavenPack Text Analytics. With a number of customers utilizing this innovative tool, including top hedge funds and investment banks. It uses the same Natural Language Processing (NLP) engine on textual content which clients can utilize everyday to increase efficiencies and improve accuracy in using data-driven decision. The RavenPack Text Analytics product was recently awarded “Most Innovative New Product” at the 2018 Technical Analyst Awards Ceremony in London. This was incredibly significant, highlighting the advancement in the big data and text analytics, recognized by the Technical Analysts independent judges. What Does RavenPack Text Analytics Do? RavenPack Text Analytics consolidates unstructured data sources that investors use everyday, into a single, enriched format, tailored specifically for financial applications. Structured Data, derived from your unstructured content with all the relevant tags and downloadable in xml and csv formats. Centralized Search across all documents including both your own and third party content, research reports, meeting and conference notes, from industry and market intelligence providers, newsletters, RSS feeds, regulatory filings, and more. Data Visualization, with interactive tools including dashboards, charts, treemaps, gauges, and more. Configurable Alerts through email or instant messaging for systematically identifying critical information buried in your internal communications. Web APIs for developers to request structured data for incorporation into their applications. At RavenPack we believe that a lot of alpha and risk management / compliance power resides in our clients' everyday textual content (email, instant messages, their own research reports, investment notes, transcripts etc) which they were unable to utilize until now. RavenPack Text Analytics solves that problem. Fundamental and discretionary investors seeking a more "quantamental" or data driven approach to investing and trading. Research Analysts and Portfolio Managers sorting through the noise and identifying relevant signals from regulatory filings, broker research, transcripts, news, blogs, investor notes, etc. Data Scientists and Quantitative Investors incorporating structured data derived from unstructured text content directly into investing and trading models. Compliance and Risk Managers automatically eliminating false positives and getting alerted on relevant internal conversations. Providing proof of conversation for regulators. 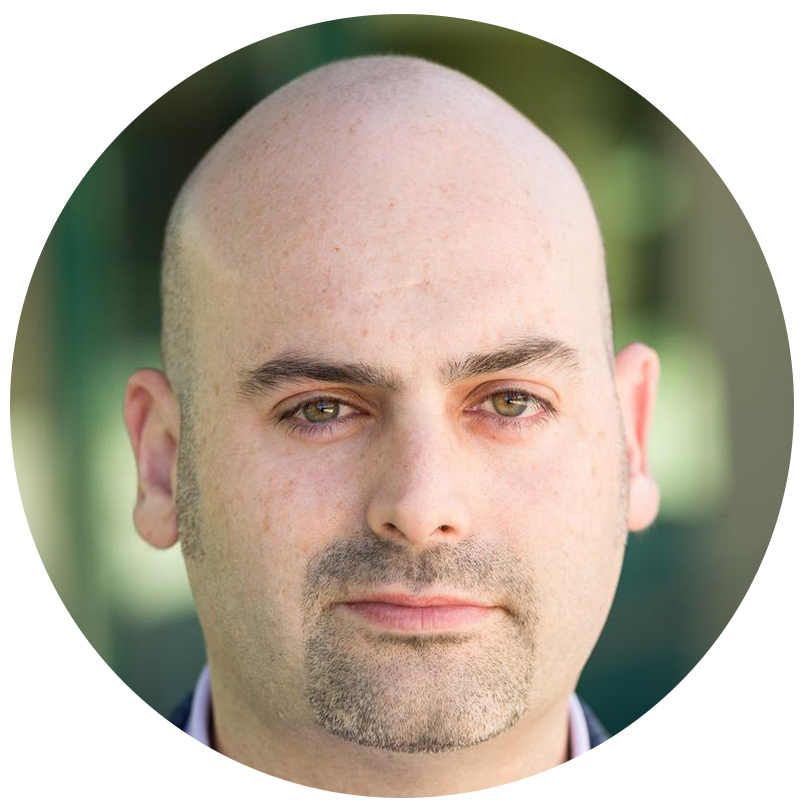 We spoke to the CEO of RavenPack, Armando Gonzalez, where he provides insights into Text Analytics within the financial sector, what challenges clients are facing and how to overcome them. Our clients are typically some of the most sophisticated hedge funds and asset managers in the world. So we're talking about the larger quantitative asset managers that trade using computer programs and algorithms. We also have some of the top investment banks in the world that use this technology, not just for trading, but also for compliance and trade surveillance. Some of the main challenges are managing large sums of data in order to make sense of it all. Additionally, clients want to have specific data sets to derive certain information. We use artificial intelligence techniques including machine learning and Natural Language Processing, to make sense of textual data. We've developed our own proprietary technology to understand information flows and in doing so, we're able to convert it into analytics that our customers can then plug into a variety of different applications. One of them would be, for example, a systematic trading system. Others include visualization tools that help generate insights visually to help business users make sense of things such as news and social media, about companies or securities that they trade. We also provide tools that allow our clients to create their own data sets, from very large disparate sources. The reason why this is so useful is that a customer can curate a data set specifically for a problem they want to solve and they can use tools like Excel to run quick analysis in order to find the information that they're looking for. RavenPack has a very ambitious set of goals and we are specifically working on making sense of other types of content, not just text analytics, we are also looking at recordings, audio, video, any aspect of the unstructured world of big data. We've been concentrating specifically on the English language and looking at textual content in English but now we're doing work on multiple languages, trying to make sense of information that may be published in Spanish or Japanese or Mandarin, in conjunction with our English based newsreaders or analytical readers, in order to support a much bigger audience or a wider market. We are also investing heavily in data science. We have our own data science team that is constantly researching our data, trying to help our customers find anomalies or basic things within these new datasets that are arising. This is to speed up their process of valuation and help them essentially generate insights much quicker than if they had to do their own research in the very early stages. So it's a combination of technologies, know-how and also research driven by purely the scientific method. RavenPack’s events have become global, with attendance exceeding 250 buy-side professionals at the London Big Data and Machine Learning Revolution in April 2018. 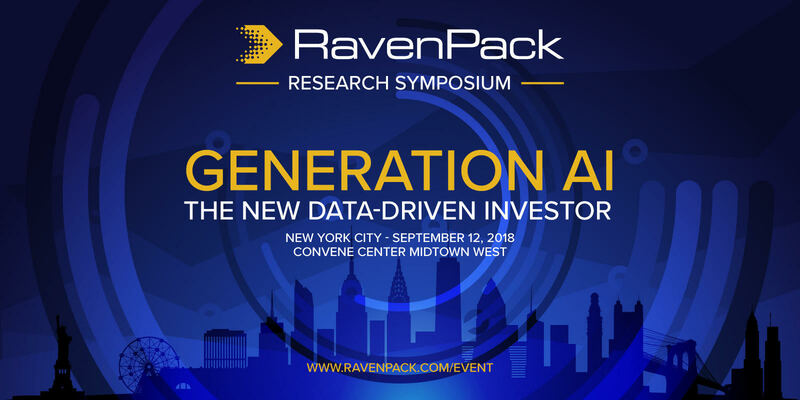 RavenPack Research Symposium returns to New York on September 12th. Read more here. Armando Gonzalez, RavenPack CEO, discusses the 5 key signs that the financial sector has entered a big data and machine learning revolution. Watch this short video from his presentation and read more insights. Our CEO Armando Gonzalez offers an informative, insightful and thought provoking presentation titled "10 Tips to Avoid an Alternative Data Hangover." He has come up with 10 key questions that financial institutions should be asking when they decide on an alternative data vendor. At the recent “Battle of the Quants” event, I was fortunate enough to give the keynote speech talking about “Exploiting Alternative Data in the Investment Process”. Given the feedback at the event, I wanted to share my views more broadly of what I believe is required to succeed in today’s world of quant investing.